This recipe is a little bit harder, but if you pay attention to the recipe and my tips, I`m sure you can handle it, and your cake will be amazing. First, you have to bake the basic cake. I already posted this recipe, so all the ingredients and tips are there. You also need fruits for this cake. I made the cake with oranges (you need about 2-3 oranges) and kiwi (about 3-4). After you make the basic cake, let it cool and cut it into two round pieces. Put all the following ingredients in a pot and mingle them well: the eggs, sugar, vanilla sugar and the zest from 1 orange. Mingle well all the ingredients until the sugar starts melting (disappearing). When it`s done, add slowly the 500 ml milk (the milk has to be warm). Put the pot on the stove and keep mingling until the cream boils. You have to be careful here. You don`t need to boil the cream. When you see that it starts boiling, turn off the stove. You don`t want to over boil the cream, it won`t be good then. Put the gelatine in some hot water (2-3 spoons). And mingle until the gelatine dissolves. If it doesn`t, you can put it on the stove for a little time, until you make sure that the gelatine is dissolved in the water. Then, add the hot gelatine to the hot cream you made before. While you let this cream cold, beat up the whipped cream. Beat it up really good. When the cream is cold, mingle it with the whipped cream. Peel off the oranges and the kiwi. Then cut them into round slices. Now, get a round pot, it should be as big as your basic cake is. On the bottom and the edges, put transparent foil (the one you use for food). On the bottom and on the edges of the pot, start putting the fruits. You can put as many fruits as you want. Just make sure they stick well to the foil. Put half of the cream on the fruits, and arrange it a little bit. Now, on the top of the cream, put one piece of the basic cake. At this point, you can moist a little the cake. Put in a cup 100 ml water, and add some vanilla extract, rum extract or just a spoon of vanilla sugar. Be sure you mingle it well, and with a spoon, put some of the liquid on the cake. You can put as much as you want. I use 100 ml water for both pieces of the cake. Now put the other half of the cream. And the other half of the basic cake. After you put the other second half of the basic cake, use again the spoon to moist it with the liquid you made. Look at the picture above. That is how your diplomat cake should look at this point. Before you can taste it, you need to put it in the fridge for at least 6 hours. I left it a little bit more, but 6 hours the cake needs to stay in the fridge. When the timed passed, take a round platter, and put in on the pot. All you have to do is turn the pot (with the platter on top) upside down. Your cake should come out without any problem. Take down slowly the foil, and your diplomat cake is done. Basically, you can use any fruits that you want. This combination is my favorite one. I will post more recipes with different combinations as soon as I have the occasion to actually make them. Linking up with some great parties, come and join us! See them right here. i don't use kiwi enough in any application, but this one is super special! what a beautiful masterpiece! So delicius looking! Will try it out as soon as I can - congrats on yr award too! This cake looks super delicious and moist! I think fruit are the best cake decorations! Oh looks delicious -and no bake! Thanks for the recipe! Looks delicious ! I prefer to eat it then make it, lol ! my goodness, that looks amazing! Way too complicated for me....but fun to read through! That's a lot of work, but it sure looks good! I'd love to have a giant slice of that right now! Thanks for linking this delight to the letter D.
What a delicious looking cake! I wish I could reach through the screen and take a bite! This looks delicious. I have to try it. Pinning. What a pretty cake, Cris! Your step by step instructions are so helpful too. Thank you for sharing this delicious recipe with us at Hearth and Soul. This looks so delicious and I really like the design you've created with those kiwis and oranges. Pinning for sure! This looks lovely! I have never heard of Diplomat cake. Thank you for sharing at Link It Up Wednesday! A beautiful cake that I'd love to eat. Looks really pretty, a perfect summer cake. Thank you for sharing the recipe at The Really Crafty Link Party. Pinned! Yummy. I want to have some now. Love it, Def. will give this a go with my gals this weekend. This is the perfect cake for the hot summer we have over here. A large piece of cake with a cuppa tea, perfect! This is like the perfect summer cake! It looks so refreshing! Thanks for sharing! That looks so delicious! I love kiwi! I need to make this one. This looks so delicious! That is awesome of you to share your family recipe with step by step directions and photos. Will have to try it. Such a beautiful cake, looks so nice I would be scared to even eat it. Heck yes, what a tasty looking cake. I tend to enjoy cakes with fruit on it. Yum! I love the name of it and the fruits are an added plus. Will try it this Summer. This is definitely a new recipe for me to dare to try. I love trying new things so I'll let you know how I made out! Oh wow, this cake looks amazing! The oranges and the kiwis would make it so refreshing. I would love to try this at home! I ve been wanting to try these cakes with the cute fruits. Never thought I could do it but you broke it down very easy. I will have to try it soon. I love baking cakes at home too! But have never made a fruit cake, you are totally inspiring to try it next time. I am vegan so I definitely cannot eat the cake but there's nothing stopping me from making it for my family. Maybe for the holidays or the 4th of July weekend. I love trying new things, especially cakes & pies. This one caught my eye because of the fruit on it. I think I'll have to try it soon. The kids could help me create it. Looks delicious. I like the cake with Kiwi, they enhance the tastebuds for me. And your cake looks like something fresh out of art exhibition. Truly Wonderful. Would love to have some. That looks like a nice END TO THE SUMMER cake! Oh wow such a pretty cake. Now I know how to make fruits not fall of from the sides.Thank you. I love the presentation of this cake. It would be worth all the extra work. This looks so tasty! I love the fruit on it. Plus it's pretty! I must make this! Very interesting! I don't know that I would have every thought about putting orange and kiwi together. I love how the cake looks! This will be a perfect cake to make for our labor day party! Of course. You can replace the cake batter with some simple biscuits. Good luck! I really love baking cake. I am gonna saved this recipe and try on my own. Thanks for this recipe! Love it! I wanted to try baking cake but I am too scared to do it, but this one looks easy and I might try this. Thanks for the recipe. I have never had a diplomat cake before. And I can bet it tastes delicious. I can give it a try. This is one unique cake but surely looks yummy! I'd love to try it but I will have strawberries and kiwi as combination, hope that will work. Thanks for sharing! I would like to make this recipe for the weekend. We will be having a family dinner. And I always look for new recipe to serve. Thanks for sharing! Baking cakes is my favorite hobby, never tried this one before, looks really good! I will do it. Thanks! That looks absolutely tasty! I love you can taste fresh fruits from it. This is so creative. I love the way the cake looks. I am terrible in the kitchen, but I sometimes try.. So far it's gone pretty good. Might try to take on this recipe challange. Looks like a lot of effort but looks Divine. Will be definitely trying it out. Thanks for sharing. I'd tell the grandkids those were green kissy lips all over it and it would be a great way to get them to eat their fruit. I'd love to try making this. We do love cakes here. Those fruits look like they're stuck on the side there! So super cool! This cake looks delicious and easy to make! Oh wow this cake looks absolutely amazing. I will be trying cake out I enjoy baking and trying new things. Thanks for sharing my family will be having this with out Sunday dinner. What a beautiful cake! It looks so yummy.. I am a cake lover. Will try it right soon. Thanks for sharing. That would be terrific with berries - lots of berries! What an amazing cake. I would love to try this. The ingredients sounds delish, yummy! This looks so delicious!!!! I need to make one of these, I love fruity cake! What a beautiful cake. 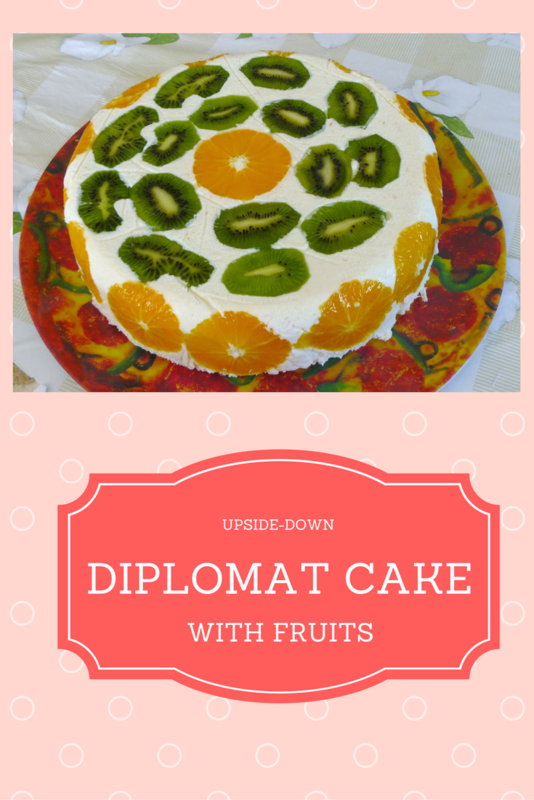 I've never heard of a Diplomat Cake but it looks so delicious. I like the use of citrus and kiwi. That turned out looking so well! I would love to make this and take it to a get together!